Anytime you import non-iTunes MP3 into iTunes, you run the risk of loosing Album Cover Art. Those placeholder images just don’t cut it and you know it. Now you can do something about it and retrieve the missing images with Tune-Up. Whether you use iTunes for your iPod/iPhone or just to sync with another device (like the Palm Pre), Tune-Up works! It’s a plugin for iTunes and runs with iTunes. Simply download the trial version and install. You can experiment with 100 fixes for free. Once installed, click the “Find your missing cover art” button in Tune-Up. The program does all the work. 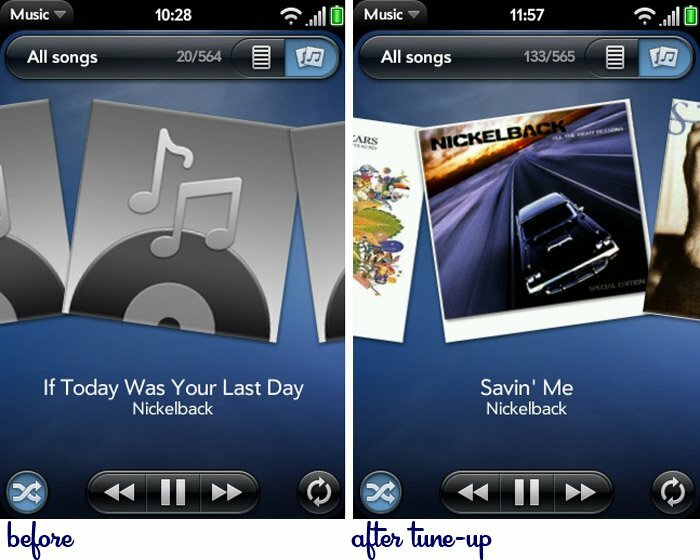 If there is a choice of album art, Tune-Up will show you the images and let you select the best one. You can either save on a song-by-song basis or use the Save All option to update your entire library. Suppose your music library isn’t as complete as it could be. Wrong song names, missing artists or incomplete album names? Tune-Up can fix that too! Select the songs up to 500 at a time and drag them to the “Clean your mislabeled music” button. Tune-Up will then compare soundbites from the MP3 files against its database to identify the song and fix the song title, artist and album embedded in your ID3 tags. Just click the Save All to update your library with the corrected info. Once Tune-Up is done, you only need to sync to your library to update your device with the correct song info and cover art. NOTE: be sure to download the trial version FIRST and use it! A coupon will pop-up in the Tune-Up window for 20% off the purchase price (1-year subscription for $19.95 or Lifetime Subscription of $29.95). The subscription is valid ONLY for that one computer. You may have noticed that I have a Playlist called “palm pre”. I have accidentally wiped my Pre music files a few times. After the last time (bad apple!! ), I decided to create a Playlist to keep track of the music I want on the Pre. I have the Pre limited to sync only to this Playlist and not my entire library.